I enjoyed Far Cry 5 in the same way one enjoys a triple cheeseburger from McDonald’s. It was tasty and filling and pretty much exactly what I was looking for at the time that I bought it, but I wasn’t exactly seeking depth of character and thus wasn’t disappointed that I didn’t really get any. Far Cry 5 never stood a chance of escaping controversy because it exists and that’s enough of a qualifier these days to crucify someone, be it the makers or the audience or both. Video games are normally pretty uncontroversial in their stances; Wolfenstein hates Nazis, Call of Duty hates terrorists, Mass Effect hates genocidal aliens and is also cool with two entities of separate species but the same gender bumping uglies. Humanizing the enemy is a great idea for developers who wish to partake in a little PR suicide, it is for this reason that while we will see media where Germany wins World War 2 and conquers the United States (Wolfenstein, Turning Point, Man in the High Castle, Philadelphia Experiment 2), I can think of only one game where the player can not just play as the German forces, but actually lead them to victory (Panzer General). It’s the whole notion of acknowledgment of existence being interpreted as support of the position and the very fact that I used world war 2 as my example would no doubt be used as fodder in presuming my true intentions. In Far Cry 5 you really have to let logic go in the face of alien artifacts and mind control drugs. The idea of Joseph Seed cutting off communication to the outside world and closing off the roads to prevent people from going out for help made sense right up until I started buying helicopters and airplanes. I’d be a bit more comforted if the game also mentioned that Seed had some kind of air defense set up and was shooting down planes. It would be a blatant bandaid and if it did I missed it, but there doesn’t seem to be much reason why I can’t fly off and get the National Guard. Actually the narrative dies when you find out at the start that the dispatcher who sent you out was a cult member from the start. I have to presume that the game doesn’t take place over a long enough span for the courts to start wondering why nobody showed up after that arrest warrant execution for the murderous cult leader. Characters in the Far Cry series have always been more closely akin to realistic, awkwardly attractive mannequins. The premise of the stories are acceptable but you know from the start how this play is going to work itself out with you building up the meter until the boss comes out, kill the boss, rinse and repeat three times, then kill the big boss. I have to hand it to Ubisoft for cosmetically altering loot stashes to “prepper stashes” and somehow creating far more controversy than the topic is worth. It goes back to the whole acknowledgement equals support idea, that Ubisoft is trying to paint preppers as mystical visionaries when the reality is that yes, the people who stash supplies will have supplies stashed when the need comes along. Along the way you are going to kill a hell of a lot of cultists, and this is where Far Cry 5 stood out to me among the prior games. You still have the laundry list of chores required to progress through the story, but you don’t have to finish the list in order to get to your destination. Me, personally, I deliberately went for outposts and prepper stashes to fill my reputation meter, allowing the ensuing kills to fill what the missions did not. As a result, the game felt more like tucking in to a Hungry Man sized meatloaf dinner rather than a full ten pound slab of beef that I would be sick of eating halfway through. The very ending itself was surprising, but no aspect of the game really creeps up on you because Far Cry telegraphs everything, and it does it loudly. The moment that really killed my immersion into Far Cry 5’s world came along with my first abduction experience. Each of the three generals for Joseph’s army will abduct you at several points during your trek for a drawn out speech or escape scene. These moments are unavoidable, period, no matter where you are. I just happened to be flying really high in a plane when someone on the ground managed to snag me in the ankle (apparently through the plane floor) with a tranq dart. As I watched the plane nosedive to the ground and the screen go hazy, I imagined the cultists picking up whatever was left of me from the plane wreckage for some good old fashioned interrogation. The game also doesn’t care what you’re doing at the time it decides you’re cruisin’ for a baptism, and I’m fine with that. I tend to mentally lump games into one of two categories: Video games and experiences, and Far Cry 5 is definitely a video game where you do game things. Otherwise, I found myself enjoying the gunplay once I got used to the rather slow bullet speed. Helicopters and planes were a massive pain in the rear until I got a way to deal with them, making it all the more enjoyable every time I shoot a plane out of the sky with my armor piercing sniper rifle and anti-vehicle weapon perk. Dogfights in the skies with planes and helicopters is fantastic and I have yet to have an experience that matches rolling down the street in that massive armed semi truck. Hunting this time around isn’t mandatory since you aren’t collecting crafting materials to upgrade your inventory or ammo limits, and because of that change I found myself actually wanting to hunt animals. You’ll still want to do some hunting since each species has a small challenge to kill 1-4 of them for perk points, but there is a big difference compared to Origins for instance that still makes you farm hundreds of animal pelts to upgrade your character. Incidentally I would have stopped playing Far Cry 5 after beating it were it not for the live events pushing me towards a 100% completion. Each week Ubisoft posts a new challenge from blowing up vehicles to roasting animals and playing in the arcade. There are personal and community goals that offer basic skins for weapons/vehicles and new outfits. The events themselves take less than an hour, generally, and I’m more willing to spend some time tracking down some more stashes and zones that I haven’t picked up yet. Far Cry 5 is begging for a New Game + mode and considering its addition to Assassin’s Creed Origins, I’m sure Ubisoft isn’t against the idea. There is already the option to reset outposts and retake them for poops and giggles. 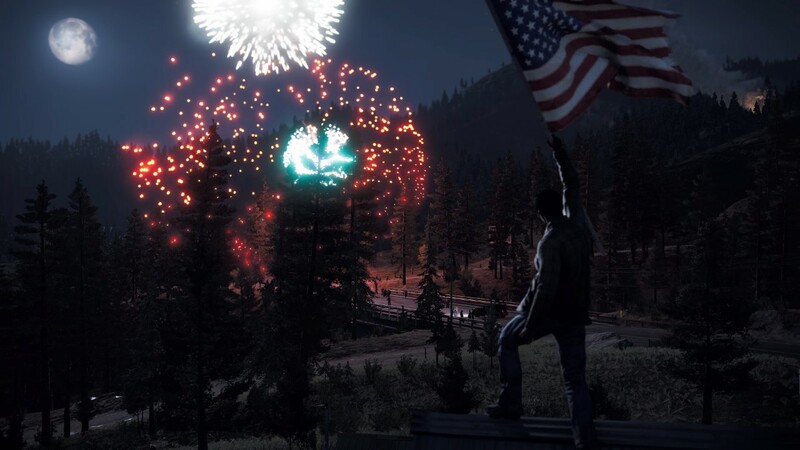 How did you feel about Far Cry 5? Boil down this article into one half sentence and rip it apart in the comments below.